Photo: Mulberry (Thomas Broughton Plantation House), ca. 1914, North Mulberry Road, Moncks Corner, Berkeley County, SC. 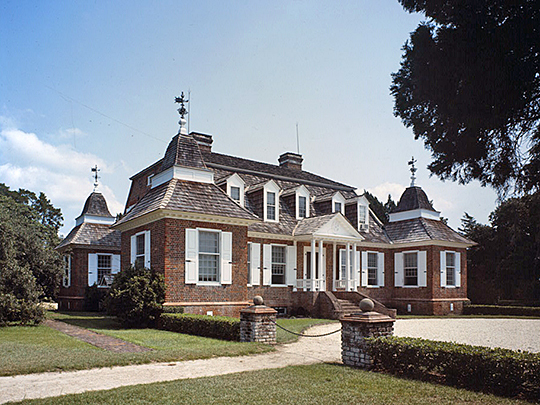 Listed on the National Register of Historic Places in 1966; designated a National Historic Landmark in 1960. Photographed by Charles N. Bayless, AIA, 1978, Historic American Buildings Survey [HABS SC-393], memory.loc.gov, accessed January, 2014. Berkeley County administrative offices are located at 1003 Highway 52, Moncks Corner, SC 29461; phone: 843-719-4234. Berkeley County was created in 1662 and named for William and John Berkeley who had been the major landholders in the then Province of Carolina. In the late 18th century the county became part of what was known as the Charleston District. The county was recreated and incorporated in 1882. Mount Pleasant served as the first county seat until 1895 when it was moved to Moncks Corner.